If you are looking for reviews on the best paint sprayers available and, perhaps, thinking of buying a Wagner paint sprayer and want to know how to use the Wagner paint sprayer you’ve just bought, then this article will definitely help you out. These days, time is always an issue when you attempt to accomplish any job. You need to juggle so many different things that it becomes tough for you to spend much time on any particular task. Painting is a time-consuming task, especially when you have to do it with rollers and brushes. In addition, they can’t give a perfectly smooth, even finish, leaving brush and roller marks on the surface. If you use a paint sprayer it will leave you with a smooth finish without any blemishes in almost no time at all! The Wagner range of paint sprayers is one of the best options to buy when you want to paint a small or large surface area quickly and efficiently. It is one of the most trusted brand in painting supplies within the USA. If you wish to add texture to your walls, ceilings, varnish your furniture or any other exterior painting, this brand provides you with excellent results. In this article, I have tried to condense all the required information to know how to use a Wagner paint sprayer in one place. These paint sprayers are suitable for both professionals and amateurs. Wagner paint sprayers are efficient for both commercial and residential purposes. HVLP (High Volume Low Pressure) sprayers will generate an even coat of paint on any surface. The basic point and trigger mechanism makes the Wagner sprayers successful in creating wonderfully painted surfaces with very little experience needed. The Wagner range has a variety of models that are convenient for professional and amateurs with accessories for every conceivable job. Wagner’s range of products is suitable for commercial and domestic applications. The range uses a variety of technologies, such as; Optimus dual tip technology to ensure super-fast painting and the iSpray nozzle which covers a large area but still finishes painting small areas smoothly. The initial step of using a Wagner paint sprayer is to prepare the area you want to paint. First, you must work out what you want to paint and what you don’t. Before you start spraying, cover the doors, walls and any furniture to avoid getting paint on them. Keep your safety foremost in your mind – wear a face mask to avoid breathing in any paint and make sure to use a stable ladder to reach high areas. If you are painting outside, then make sure you know how much wind there is. If it is a windy day then the paint will disperse over a large area and cause a big mess. Painting with a Wagner paint sprayer is entirely different from using the traditional equipment of rollers, brushes and even other spray gun brands. The paint comes out of the can at an enormous speed due to the high pressure provided by the powerful motor, and it produces a mist which gives an excellent finish. X-Boost Turbine technology that Wagner use comes with a powerful motor three times more powerful than any others, which contributes to the finishing speeds. The spray gun provides a flawlessly smooth finish incomparable to any roller or brush finish. Thanks to the rotating cap, the Wagner 0529010 can spray paint both horizontally and vertically. It is among the most effective sprayers on the market at the moment, perfect for both indoor and outdoor jobs. The Wagner Flexio 590 has an advanced nozzle system available, with which you can easily change the patterns so that the final finish is to your taste. It is a product that is very easy to maintain, all that is needed is to rinse the container with clean water, put it back on the device, and pull the trigger a few times to clean the inner tubes. Be careful not to wash the unit itself as this risks damaging the electronic parts. The Wagner Power Painter Plus is the go-to option for individuals who want to do their painting in as little time as possible – making your painting three times faster than normal! The price is affordable and will fit most budgets. It’s a very cost-efficient machine and is worth every penny. This Wagner paint sprayer uses high-speed piston pump technology to spray paint over the painting surface. The rotating nozzle helps adjust the width and desired pattern of the spray. It works on a simple principle; all you have to do is fill the reservoirs with paint and pull the trigger, which makes no prior experience necessary. It contains the Optimus Dual Tip Technology which guarantees a nice even coating and leads to less overspray onto the surface that you are painting. The Wagner company is very well-known for the quality of their products. All the sprayers are made of hard materials and are very durable. Wagner has been in the business for a long time, and they make sure to indulge all types of painting enthusiasts with good commodities. The air pressure can be easily adjusted using the power dial which controls how fast the paint will spray out of the nozzle. Turning the tip will change the spray pattern from a vertical or horizontal spray pattern. These two factors affect the movement you need to make when spraying and the distance from the surface to ensure an even coverage. You should maintain at least 10 inches between the sprayer gun and the surface to be painted. The gun will spray a lot of paint in a very short time, so if you hold the gun very close to the surface, it will apply too much paint on one spot. Start from a corner and spray in a slow back and forth motion. Remember to overlap every stroke by 50% on the next stroke. To avoid any drips, you must keep the gun moving a constant speed. Having a higher air pressure will let you paint faster, but this will also affect the evenness of the coating. The Wagner Company is a leading paint company, famous for producing superior quality products. It has been manufacturing a large variety of spray guns of various designs to meet different purposes of the customers. The Wagner Flexio, Power S, and Paint-Ready are the most popular series the company has produced. The quality of the Wagner paint sprayers has always been evident in the reviews by users. Without appropriate knowledge, it is impossible to get the best result from the sprayer. 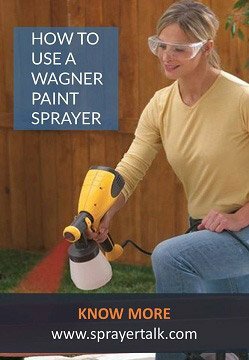 To successfully use the sprayers and to get your desired result, you must know how to use a Wagner paint sprayer. I hope from this article you have found the answer to all your questions regarding the use of a Wagner sprayer.